I’m lucky, I’m generally a happy person. Not a ‘glass half full’ or a ‘glass half empty’ kind of person. More a ‘take the damn glass and drink whatever’s in it’ kind of person. Head-of-Happiness-Sally often asks me how I’m always happy. So, I thought I’d try and figure that out (I’m not always happy btw). I picked a normal working day and decided I would try to acknowledge moments of happiness. Throughout the day I snapped pictures and made notes on my phone – a digital detox this ain’t. So join me on my journey through a distinctly average Tuesday. (In my opinion, usually the dullest day of the week). 0730 – Alarm goes off. I feel tired and still a little rough after a hedonistic weekend celebrating my Mum’s birthday. Eugh. Snooze buttton. 7.57 – Post-shower. Listen to Radio 4. A politician is being interviewed and, quite rightly, given a hard time. It makes me smile. As I listen, I apply two separate face serums and a moisturiser. I LOVE face creams. Serums, tonics, cleansers, balms… love them all. The act of applying them is something I really enjoy. In that moment I acknowledge that it really does make me feel happy. It’s a bit of daily self-care and an important part of my morning routine. 0800 – Slight annoyance. The lights have tripped again. I blame our dodgy iron – tsk. I shout down the stairs for my husband to hit the trip switch back on. 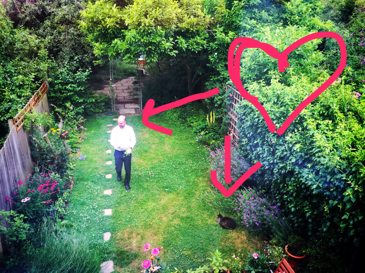 0815 – Look out the window as I brush my teeth and see my husband and our cat go for their daily morning walk down the garden together. JUST LOOK AT THEM! My two favourites! I see this sight most mornings and it always makes my heart sing. The highlight of my morning. 0822 – I join The Husband and The Cat in the garden. I like to squeeze in a little garden visit before I leave for work if I have time. So much changes from day to day at this time of year. The sunflowers have opened their smiley faces today, hurrah! They’re my favourite flower. They always perk me up. (I think everyone has a flower that does this – for my Mum it’s pansies. You?). The garden is filled with beauty. Looking at the living things I have grown and nurtured is joyful. 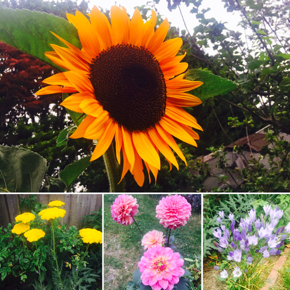 My garden makes me ridiculously happy, always. 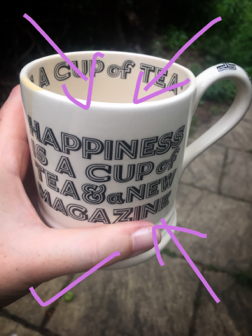 Oh – and I notice what it says on my mug – only took me twenty mins to spot it but so apt and cheering. 0832 – Time for work and a walk to the train station. I’m aware my happy demeanor shifts. I feel more focused and slightly ‘wound up’ as I think about the day ahead and what I need to achieve. But… on the way to the station I spot this guy and his choice of bed makes me grin. 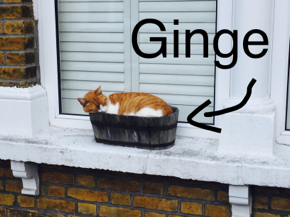 He’s a bit of a local celeb who we lovingly refer to as Ginge. 0855 – Train journey. It’s packed. It’s hot. I have a headache. I am merely existing. 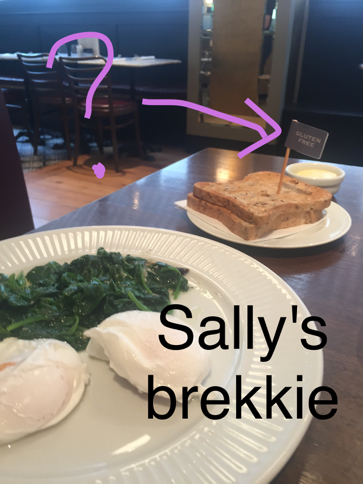 0940 – Breakfast meeting with my boss – who happens to be Sally! It’s really nice to see her. In fact, we haven’t seen each other since last week so it’s fun to catch up. Plus, she’s smiling so that makes me smile. 1000 – Sally’s breakfast arrives. She can’t eat dairy… or gluten… …or wheat… or good stuff. I feel genuinely happy that I’m not on that diet and wolf down my toast and butter. 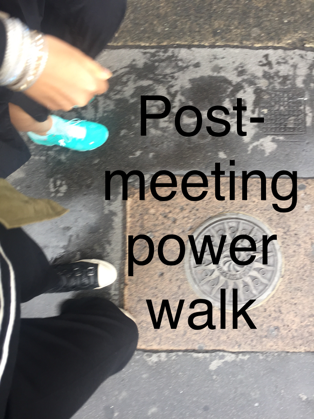 1145 – Sally and I walk back to our office with a spring in our step after a positive meeting at the BBC. Feel buoyant and energized after a job well done. 1435 – Sally and I finish ANOTHER positive meeting – this time over lunch with a decidedly lovely agent. She was a really interesting, smiley and enthusiastic person. That kind of attitude is contagious. So cheering. I’d like her to be my actual friend. 1446 – Back in the office, I notice I feel exhausted. Positive vibes disappear and I crack on with work… emails, calls, typing up notes and ideas. I conclude sitting at my computer doesn’t give me masses of joy. 1800ish – Happy to leave work in good time. I’m home before 7pm which is a treat. 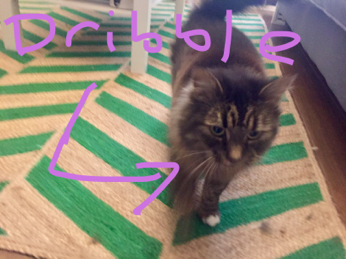 My cat is THRILLED to see me, she rubs around me and purrs. Her sheer delight at my presence causes her to dribble. In that moment we love each other very much and are both very happy. Please note from that blurry picture that even when she’s happy, Hendricks looks kind of grumpy. She can’t help her face, people! 1930 – 1945ish – A significant period of anger and frustration whilst I try to deal with HMRC over a problem with my VAT. Let’s just leave it there, shall we? 2000 – Make dinner. I like cooking a lot. I make a Greek salad and take the time to present it nicely in a Moroccan style serving dish (it’s new and very pleasing). Also cook fresh new potatoes from the garden, so I feel a bit proud of that. Preparing dinner doesn’t make me happy per se – but I realise that I’m really ‘in the moment’ when I do it. I don’t think about anything else – just focus on the task at hand whilst listening to Radio 2. That’s got to be good for the soul after a day at work. 2030 – Alex and I decide to watch some TV. We pick a new series called ‘American Gods’. It’s pretty violent and brutal TBH. Whilst watching TV is a passive experience (and certainly not the most exciting thing one could be doing on an evening in London), I note how content I feel sat in my lovely home, feet up on a cosy sofa. Life’s pretty good right now and I appreciate it. 23.00 – Head upstairs to do my ablutions. I love washing my face at the end of the day. So much so, I do it twice. Every night. As I slip into bed I feel content and calm. I put on a podcast (Desert Island Discs – Nick Clegg… a very interesting man it turns out). I fall asleep before I hear his fourth track. Still reading? A long day – and hardly one of my most thrilling. But what did I learn from the process? Well, just the act of diarising my day made me very aware of my feelings and actions. It made me LOOK FOR HAPPINESS. It made me appreciate the small things (and big things) in my life, as well as the wider world around me. For instance, on my commute I wasn’t particularly happy, but I did notice a fellow commuter smiling broadly as she listened to something on her headphones. And another incredibly chic lady chatting on the phone enthusiastically about her upcoming holiday. What jolly nice things to notice. I noted the things that regularly make me happy (I’ll do those more) and that, for me, feeling content is better than any euphoric high. I urge you to try and diarise your own day. Even just for a couple of hours. Notice what makes you even a teeny bit happy, and snap a picture. It might be a text from a friend, hearing a bird sing, drinking a gin and tonic, eating an ice-cream, a phone call with a family member, spotting a butterfly, a new face-cream (can you tell these are all things that make me happy?). When you look back at your photos you’ll realise just how happy you are. Do it tomorrow. Do it, and then share what makes you happy in the comments box below and spread some of the joy.